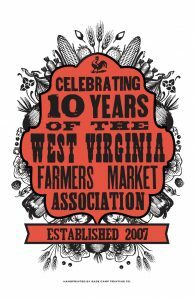 The WVFMA has been serving the state of West Virginia’s farmers markets for 10 years. We wanted to do something special to celebrate the beauty and historic significance of our beloved state. Together with the help of Base Camp Printing Company, located in Charleston, WV, we designed this commemorative limited edition poster. These gorgeous posters are now for sale at the link below at $20 each. All sales must be either picked up at our Charleston office on a scheduled date or mailed to a location within the United States. Standard shipping rates apply to each poster shipped. Supplies are limited to two posters per order. For more details about the poster or the history of the WVFMA please contact us at coordinator@wvfarmers.org.